The majority of mutton snapper are found in the Western Atlantic from Massachussetts to the coast of Brazil. The majority of the catch comes from Florida with minor catches from South and North Carolina. Handline cear is the primary method of commercial capture in the South Atlantic with a small percent caught by divers. In the Gulf of Mexico, 60% are caught using bottom longlines, 36% by handline and 2% by divers. Mutton snapper from the US is not exported to other countries. Mutton snapper are jointly managed by the Gulf of Mexico and South Atlantic Fishery Management Councils. Management regulations include annual catch limits, minimum size limits and efforts to reduce turtle bycatch in the Gulf of Mexico bottom longline fishery. Mutton snapper have life history characteristics that make them moderately vulnerable to fishing pressure. However, fishing mortality is relatively low and abundance is high. Steady increases in stock have been observed since the mid 1990’s. As divers visually identify the fish before targeting it, bycatch levels are not a concern with the mutton snapper diver fishery. The handline fishery does result in the bycatch of other snapper or grouper speices, however the fishing mortality for all of these species is considered to be sustainable. Handline and diver fisheries have limited contact with the ocean floor and thus do not cause habitat damage. Yellowtail snapper landings have increased in the Gulf of Mexico over the last 60 years, though there have been large fluctuations. A peak of 1000 t in 1994 was followed by a decline to 400 t in 2006. However, catches increased rapidly again to 1000 t in 2016. In the US South Atlantic, catches are smaller and have fluctuated between 20 t/yr and 100 t/yr with no clear trend. The most recent peak was 100 t in 2012, but had dropped to 25 t in 2016. All landings remain in the US market, with catches in 2016 from the Gulf of Mexico and US South Atlantic worth US$6.8 million and $200,000, respectively. Yellowtail caught by vertical lines in the Gulf of Mexico is Recommended due to low impacts on the target species and habitat and ecosystem. Stock status is healthy and fishing mortality rates are at a sustainable level, while vertical lines have minimal impacts on the seafloor and there are some measures in place that may help protect the role of snappers in the ecosystem. There are concerns over bycatch of endangered species such as speckled hind in red grouper and hogfish in Atlantic US, and speckled hind in both regions. Management is considered moderately effective in both regions and measures to rebuild overfished stocks are in place. The Hawaiian Deep 7 complex is comprised of 7 bottomfish species: 6 snappers and 1 grouper. Catches peaked in the 1980’s at 439,000lbs but since 2000, have averaged only 234,000lbs/year. The pink snapper, ruby snapper, and red snapper make up the majority of the landings. Most of the species are consumed domestically within Hawaii. Additional snapper are imported from Indo-Pacific islands to meet Hawaiian demand. The deep 7 are managed as one unit. The group is considered to be at healthy abundances and not overfished. However information on how commercial and recreational fishing impacts individual species is lacking. The Hawaiian grouper is near-threatened and vulnerable to fishing pressure. Regulations exist that control size limits, gear limits, quotas, and catch reporting. The fishery is closed if the catch limit is reached, and if it is exceeded, the quota for the next year is reduced. Population assessments are conducted every 2-3 years, although the deep 7 are studied as a group, and not separately. Although the Hawaiian Deep 7 are caught by handline, which is a selective way of fishing and allows for any bycatch to be released, the greater amberjack and gray snapper which are species of moderate concern, are sometimes caught. The handlines each have 6-8 circle hooks, and do not come into contact with the seafloor. The Hawaiian snapper which is targeted, as well as gray snapper which is caught as bycatch, are both species of exceptional importance. This means that their role in the ecosystem is disproportionately large compared to their biomass. Due to the importance of these two species, ecosystem-based management measures have been implemented such as the fishing ban in the Northwestern Hawaiian Islands. Gray snapper, commonly known as uku in Hawaii, are a species of fish inhabiting the shallower areas of the water column. They have increasingly been targeted in recent years as alternatives to deepwater fish during challenging weather conditions and when quotas for deepwater fish have been met. Most uku is consumed within Hawaii, with some sold in mainland US. Concerns exist over the uku’s stock status. It is not known whether overfishing is occurring, but decreased amounts of catch despite increased fishing effort suggests that abundance is decreasing. The uku has life history characteristics that make it inherently vulnerable to fishing pressure. The uku are managed together with other “non-deep” species. Catch limits for the group exist, although it is not known if quotas have been met until the season closes and fishing data is analyzed. No observer coverage exists, although fishermen are required to record data including any bycatch caught. Uku are moderately well managed. Troll and poles have minimal habitat impact since they do not contact the ocean floor. Handlines are suspended over the benthos, and equipped with circle hooks which are less prone to snagging and causing damage unlike traditional J-shaped hooks. Little bycatch is caught using handlines, poles and troll. However the species that are occasionally caught are vulnerable to fishing pressure and have an unhealthy stock status. These include species such as the Hawaiian grouper and sharks. The diver fishery represents 10% of the gray snapper landings in the US. The bulk of the landings (85%) is caught by handline in the Gulf of Mexico as well as the Southeast Atlantic. A negligible amount is caught by longline. Between 1994 and 2013, commercial landings of gray snapper ranged from 286,000lbs to 670,000lbs. The majority of the gray snapper is caught recreationaly. Between 1995 and 2014, an average of 1,860,000lbs were caught. Gray snapper from the US is not exported to other countries. Gray snapper are managed by the Gulf of Mexico Fishery Management Council and the Florida Fish and Wildlife Conservation Commission. The fishery is moderately well managed. Regulations include annual catch limits and minimum size limits. Gray snapper have life history characteristics that make them moderately vulnerable to fishing pressure. These include a long lifespan and high fecundity. Stock status is unknown as no assessments of the population have been performed to date. A stock assessment is scheduled for 2018. Fishing mortality is thought to be high. As divers visually identify the fish before targeting it, bycatch levels are not a concern with the gray snapper diver fishery. Divers do not make contact with the ocean floor and thus do not cause habitat damage. Bluestriped snapper is a non-native species of snapper that was introduced to Hawaii in the 1950’s. Abundance and population health are not major sustainability concerns since the species is non-native. 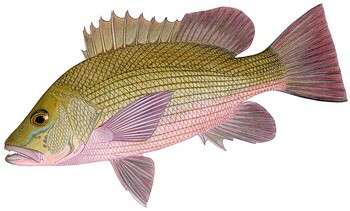 Bluestriped snapper are usually caught as part of a mixed fishery. Bycatch rates are low. Bluestriped snapper are well-managed by the Western Pacific Region Fishery Management Council and the Hawaii Division of Aquatic Resources with measures such as catch limits and bycatch mitigation. The fishing gears used to target bluestriped snappers do not make contact with the ocean floor and as such, do not cause habitat damage. An average of 254,190 lbs of bluestriped snapper was caught between 2003 and 2014 in Hawaii. This species is consumed within Hawaii. Blacktail snapper is a non-native species of snapper that was introduced to Hawaii in the 1950’s. Abundance and population health are not major sustainability concerns since the species is non-native. Blacktail snappers are caught as part of a mixed fishery. Bycatch rates are low. Blacktail snapper are well-managed by the Western Pacific Region Fishery Management Council and the Hawaii Division of Aquatic Resources with measures such as catch limits and bycatch mitigation. The fishing gears used to target blacktail snappers do not make contact with the ocean floor and as such, do not cause habitat damage. An average of 25,754 lbs of blacktail snapper were caught between 2003 and 2014 in Hawaii. This species is consumed within Hawaii. Brazilian snappers have been caught commercially since the 1950’s in response to the declining tuna and lobster populations. The Brazilian snappers are caught by artisanal fishers in the Northeast and Southeast regions using handlines and traps. Yellowtail snappers represent 20% of the landings, lane snapper are 50% and mutton snapper is 30%. Landings of snappers have been decreasing in the last decade. Observations indicate that the snapper stocks are being overexploited. As snappers are landed together as “snapper” instead of differentiating each species, it is difficult to monitor and manage the populations. Management is ineffective as very few regulations exist to protect the populations. Current regulations include the obligation of having on-board maps, as well as the legalization of handlines and traps. There are no size restrictions, catch limits, seasonal closures, area closures, or spatial management. Although some marine protected areas (MPAs) exist, the areas covered are insufficient to increase the abundance of reef fish. Handlines and traps cause the bycatch of threatened species that occupy important roles in the ecosystem. These include species such as black grouper, parrotfish, and red snapper. Removal of these bycatch species from the ecosystem can be detrimental. Handlines do not make contact with the ocean floor and thus do not cause habitat damage. The use of traps can cause habitat damage to the rocky-bottom and coral reefs as fishers drop their anchors over this habitat to set the traps. The removal of snappers from the ecosystem is of concern because the snappers are a keystone species i.e. they play a critical role in the ecosystem. Lane snappers are caught by handline in the US South Atlantic, and by handlines and bottom longlines in the Gulf of Mexico. The Gulf of Mexico represents 94% of the US commercial landings of lane snappers. The population status of lane snappers is unknown as there are no stock assessments available. However, the International Union for the Conservation of Nature (IUCN) lists lane snappers as Near Threatened due to declines in catches. The lane snapper fishery causes the bycatch of species that are threatened including loggerhead turtles and blacknose sharks. Management has implemented regulations aiming to decrease bycatch. The fishery is also regulated via catch limits and minimum size limits. While handline-caught land snappers cause no habitat damage, bottom longlines have the potential to cause some damage since they make contact with the ocean floor. Landings of Argentine red shrimp in Argentina have increased over the last several years, from 80,000 mt in 2012 to 170,000 mt in 2016. The US imported around 12,000 mt in 2017 (approximately 2% of total shrimp imports), worth almost US$120 million. The stock is not considered to be undergoing overfishing, however, there are significant bycatch concerns over penguins, sharks and rays. Although management of the Argentine red shrimp stock is considered moderately effective, bycatch strategy is a significant concern and results in an ineffective rating for the management criterion. Habitat impacts from trawls are considered moderate, and management does not consider ecosystem impacts of the fishery. Vermilion and yellowtail snapper comprise more than half of all snapper landings in the US, and are usually sold domestically. The catch of both species combined in 2010 was worth more than $12 million. Landings of snapper have been stable recently, except in Louisiana where there have been a few signs of decline. Management is moderately effective, as stock assessments are performed regularly, although data robustness could be improved by collecting fishery-independent data. Vermilion snapper have a moderate resilience against fishing pressure, and yellowtail snapper have a low resilience against fishing pressure. The vermilion snapper population is not thought to be overfished, although there are some uncertainties regarding the latest stock assessment. The yellowtail snapper population is currently healthy. Handlines, rod and reels, as well as electric/hydraulic reels cause minimal damage to the habitat as they do not touch the ocean floor. It is unknown how the removal of snapper affects the ecosystem, but the large amounts of snapper being removed are concerning. A variety of species that are threatened, endangered, overfished, or depleted are caught as bycatch in the snapper fisheries. These include several species of grouper, and sea turtles. Gray snapper are managed by the Gulf of Mexico Fishery Management Council and the South Atlantic Fishery Management Council. The fishery is moderately well managed. Regulations include annual catch limits and minimum size limits. Management in the South Atlantic is attempting to reduce the bycatch of the overfished red snapper via a rebuilding plan. Gray snapper have life history characteristics that make them moderately vulnerable to fishing pressure. These include a long lifespan and high fecundity. Stock status is unknown as no assessments of the population have been performed to date. A stock assessment is scheduled for 2018. Fishing mortality is thought to be high. Handlines used to target gray snapper cause the bycatch of a number of other species of concern. These include red snapper, red porgy, and red grouper. Endangered goliath grouper is also sometimes caught as bycatch in this fishery. Handlines do not make contact with the ocean floor and thus do not cause habitat damage. The bottom longline fishery in the Gulf of Mexico incidentally captures overfished blacknose sharks and threatened loggerhead turtles. This can result in potentially severe impacts to these species. Bottom longlines do make contact with the ocean floor and can cause moderate damage to bottom habitats. Almost 1,400 mt yellowtail snapper were landed in the Mexican Gulf of Mexico in 2014. Almost all is exported to the US. Stock status is unknown, but evidence exists that it is declining. Other overfished species are caught by the fishery, including red grouper, black grouper and lane snapper. Management measures are limited and effectiveness is uncertain. Although the species has an important role in the local food web, no ecosystem management policies exist. No habitat concerns exist for the gear type.